Lawyers for former Chilean President Augusto Pinochet are fighting a court ruling that he is fit to stand trial for alleged human rights abuses. They scored a minor initial victory when an order to place the 89-year-old under house arrest was suspended. Victims' families celebrated as Judge Juan Guzman's ruling brought him a step closer to trial on charges of murder and kidnapping during the 1970s. But Gen Pinochet's lawyers say he is being persecuted. They are now appealing against the substance of the ruling. The charges relate to the murder of one Chilean and the disappearance of nine others as part of Operation Condor - a conspiracy by six South American regimes in the 1970s to hunt down and kill their left-wing opponents. Viviana Diaz, president of the Association of Relatives of Disappeared Persons, told the Associated Press news agency that it was "a historic decision that must be celebrated by all democrats". She added: "This is great news for all those Chileans who do not accept impunity in the violations of human rights." Mrs Diaz later led a march of celebration along the main street of Santiago. 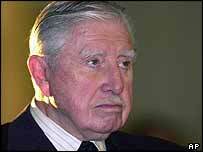 But lawyers for Gen Pinochet called Judge Guzman's ruling illegal. "This is no more than a new episode of the most relentless persecution this country has ever seen against one person," said Pablo Rodriguez, one of his legal team. The BBC's Clinton Porteous in Santiago says they appear to have won a minor victory with the suspension of the house arrest order. Judge Guzman said he made his decision to charge Gen Pinochet after studying an interview that he gave to a Miami TV channel in November 2003. In it the former leader said he saw himself as "a good angel", and blamed abuses during his years in power on subordinates. The judge said that the interview, in which the general gave apparently lucid answers to questions, was "one of the elements taken into consideration" in his ruling. The Supreme Court only decided to strip the former leader of immunity from prosecution in August. But so far the state of his mental health has prevented him from standing trial.